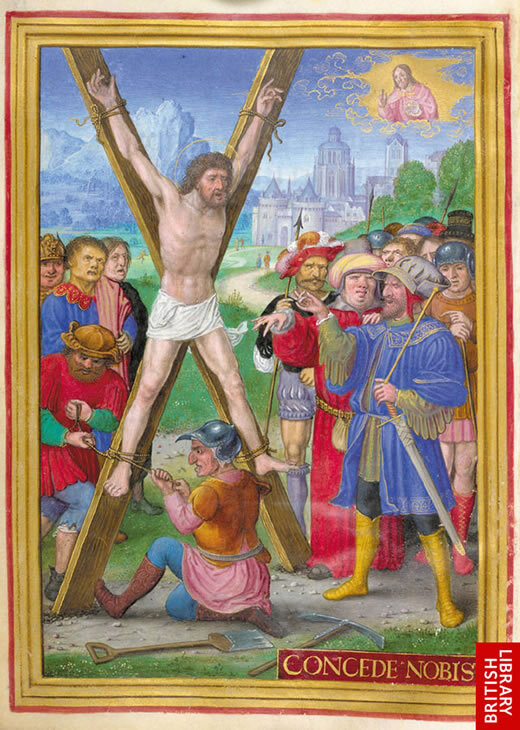 St. Andrew is known as the apostle of the Cross on account of his martyrdom: like his brother Peter, Andrew suffered crucifixion, not in the same manner as Christ, but upon an x-shaped cross where he hung for two days before his death. At the end of the liturgical year, the Church gives us to meditate upon the second coming of Christ. As we consider the Final Judgment, Christ is presented to us under two figures: Bridegroom and King. The saints of November 22nd and 23rd, St. Cecilia and Bl. Miguel Pro, are particularly known for their devotion to Christ under these two titles – Cecilia’s Spouse is the King of Fr. Miguel. It will be helpful to consider what each of these titles reveal to us about Christ and the Day of Judgment. In the book of Revelation, Christ is presented as the Bridegroom and the Church is his spotless Bride. The relation of the bride to her bridegroom recalls the whole-hearted devotion which we are meant to have to Christ. It is for this reason (namely, allegorical testimony), that St. Paul tells us that, while the one who marries does a good thing, the one who remains celibate does better (cf. 1 Cor 7:38). The vocation to consecrated virginity is greater than that to married life, not because the individual is necessarily more holy, but because the virgin is a clearer sign of the Kingdom which is to come – where they will neither marry nor be given in marriage. Moreover, it is happier to remain celibate, “An unmarried woman or a virgin is anxious about the things of the Lord, so that she may be holy in both body and spirit. A married woman, on the other hand, is anxious about the things of the world, how she may please her husband. I am telling you this for your own benefit, not to impose a restraint upon you, but for the sake of propriety and adherence to the Lord without distraction” (1 Cor 7:34-35). In his homily to the newest princes of the Church, willing to shed their blood for love of Christ and the life of His Church, our Holy Father chose not to allude to the glory of the ceremony surrounding their elevation, but rather did what he does best and what he encourages his priests to do- he stuck to the Gospel. 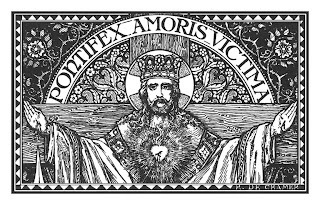 On this glorious Solemnity of Christ the King, the Church’s message is both realistic and sobering- Christ reigns from the Cross and we are to stand with Him at all costs. Interpreting the Petrine ministry in light of St. Paul’s great Christological Hymn in Colossians, the Holy Father noted that the primacy of Peter and his successors is totally at the service of this primacy of Jesus Christ, the only savior; at the service of His Kingdom, i.e. of his Lordship of love, so that His Kingdom might come, spread, and renew all men and all things, transforming the earth, making peace and justice blossom within her. The world was created through Christ, but because of sin it no longer reflects His glory and is on the road to perdition. Through the Fall, man has surrendered all of creation to the reality of evil. Through the Incarnation of Christ, however, the hope of the restoration of all things is made effective. The life of grace, allows us to stand with Christ at the foot of the Cross, where we in turn receive grace upon grace. The literal sense - Abraham believed in the resurrection. The spiritual sense - Christ would be sacrificed for our sins. In his Exhortation, Verbum Domini, the Holy Father offers a vision of the senses of Scripture which has been lost to most popular Catholic exegetes of our day. Following the scholastic division of the Scriptural senses into the literal and the spiritual (the spiritual being further divided into three senses: the allegorical, moral, and anagogical), Pope Benedict emphasizes that the senses cannot be wholly separated, since it is the same Spirit which has inspired them. 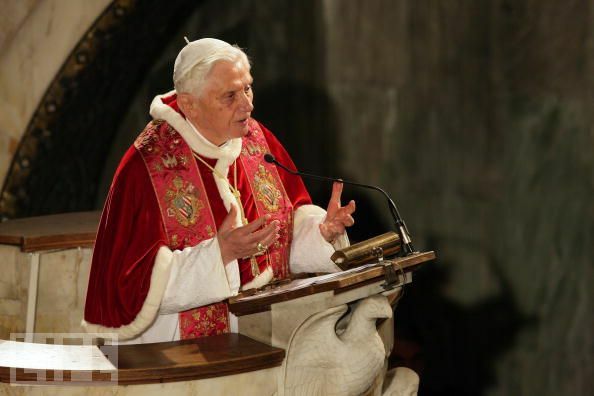 Moreover, the Holy Father offers a vision of the literal sense which is far broader than that which many modern exegetes would allow; but, as will be shown, his Holiness is well founded in the tradition. It is not at all uncommon to find the literal sense of Sacred Scripture defined as “that meaning which the sacred authors (i.e. the human authors) intended to immediately express.” This is the definition adopted by the Pontifical Biblical Commission (PBC). Why, even Mark Shea and Fr. Corapi have defined the literal sense in this way! There is only one problem…neither the Catechism of the Catholic Church, nor any Vatican document, nor the Pope in this most recent Exhortation has adopted this definition. This idea seems to have come in through protestant exegesis; it certainly is not from the Catholic tradition of Scripture study. 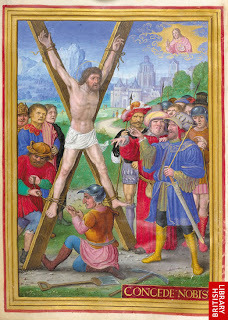 The Church gives us to meditate upon the Kingship of Christ in the immediate context of his suffering and ignominious death – as the ancient hymn relates, Regnavit a ligno Deus, “God reigns from a tree.” Indeed, Christ is already King as God, even when he dies upon the Cross; and, what is more, through this death he gains the authority and the kingship over heaven and earth even as a man! Through his suffering and death, Christ is not only King according to his Divinity, but even according to his humanity – it is Christ, both man and God, who will come again and manifestly claim the world as his kingdom. 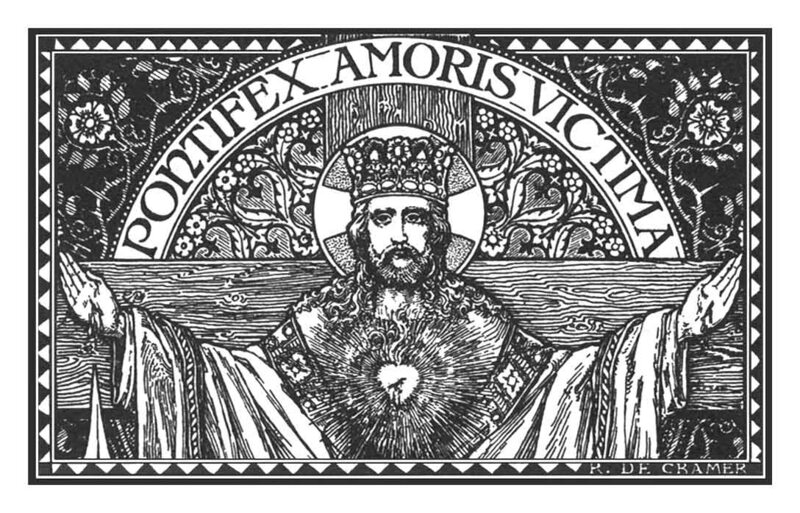 Christ is King in his humanity, and all creation will be made subject to him; but, though he had this authority from all eternity as God, he yet had to learn how to rule as King in his humanity. God is King by his very essence, and thus has no need to learn how to rule well; but in his humanity even Christ is not King by natural right, for such authority is given by God to men on account of the Divine will – thus, the man Christ is not a King by nature, but by divine election and human acquisition. So, in order that Christ should be a good King of the universe, it was necessary that he learn how to rule well those who would be subjected to him. 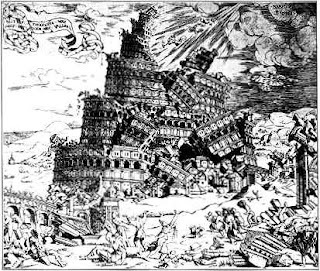 The Antichrist tells us to "build the city of God"
It is not my intention at this time to discuss the various merits and demerits of OCP or of any particular song – but I will mention the refrain of two hymns, not so much to criticize those hymns in particular, but rather as a means of indicating the view many modern(ist) Catholics have regarding the second coming. At some parishes in the United States, it is still not uncommon to hear: “Let us build the city of God, may our tears be turned into dancing!” or “Sing a new Church into being, one in faith and love and praise!” Beyond the fact that these songs have a mystical ability to turn otherwise respectable adults into buffoons, their real danger is in the theology which they embody. These songs (and others like them) are a deception of the Antichrist. First, we must consider whether the body which is raised is identical with the mortal body we now possess. 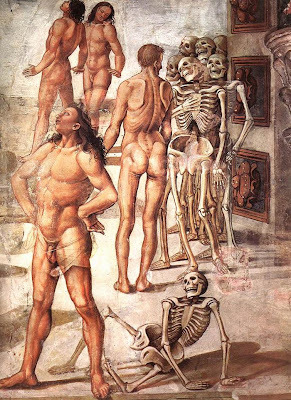 We will not delve into the very important and interesting theological speculation regarding the qualities of the risen body, but will simply consider the identity of the resurrected body – that it is the very same body as was separated from the soul in death. Second, we will consider the most popular objection against the resurrection of the body – whether a cannibal will be resurrect in his own body. 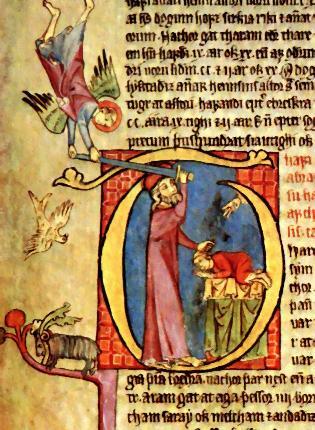 The question of cannibalism gathers several issues together: First, how can both the cannibal and his victim rise, since the cannibal has consumed the other’s flesh? Second, what if a bear eats a man and then a man eats that bear? Third, what about organ donors? Fourth, what about children who die when only just barely conceived, how will they have enough matter for a resurrected body? Many many other questions besides are answered in the course of discussing the more basic question of cannibalism and the resurrection – we will even see what happens to all our excess fingernail and hair clippings! According to the common teaching of theologians, and of the Fathers and Doctors of the Church, the chief pain of purgatory is the delay of the beatific vision. The soul suffers immensely for she knows that she will soon see God. She loves God intensely and desires to be with him. She is confirmed in good and so has a certain hope of heaven; but she knows too that she would already be enjoying life everlasting, if only she had prepared herself more on earth. Thus, the primary suffering of purgatory is the waiting – it is this waiting which is most purifying. It is also the teaching of theologians that the suffering of purgatory is generally much greater than the suffering experienced on earth. 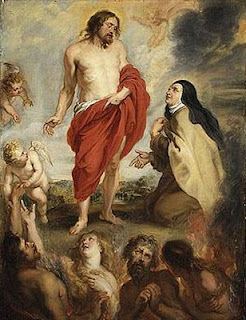 Thus, to endure a little suffering on earth with a true spirit of contrition and love, and with the intention of offering that pain for the purification of one’s soul, is to gain a great advantage – a little pain on earth can avoid a great deal of suffering in purgatory. Hence, we ought to desire to live out our purgatory as much as possible while still on earth! The primary means we can do this is through prayer. Is there fire in purgatory? The doctrine of purgatory is revealed through certain scriptural texts which speak of a burning fire – cf. 1 Cor 3:15, 1 Pet 1:7. Though there are certainly other passages of the Bible which can be drawn upon (e.g. Job praying for his dead children, the Judas Maccabeus praying for the dead), the Tradition of the Church has principally relied upon the passages referring to fire – this is especially noticeable in the declarations of Florence and Trent. Hence, we come to a very important question: If the Church discovered the doctrine of purgatory through meditating upon the scriptural images of a purifying fire, ought we to hold that there is material fire in purgatory? With the help of the Catechism of the Catholic Church and the great Thomistic theologian Fr. Reginald Garrigou-Lagrange, we may succeed in shedding some light upon this question.